The Harton POD is a complete WRAS - approved tank and pump assembly with its own plant room, all located fully below ground with a system-monitoring panel sited elsewhere which can be linked to a telephone autodialler, computerised Building Management System or additional on-site alarms. PODs can be sited under any free area, even under a car park, thus maximising valuable above-ground usable space and avoiding the need for an expensive separate building. In most cases planning permission is also not required. 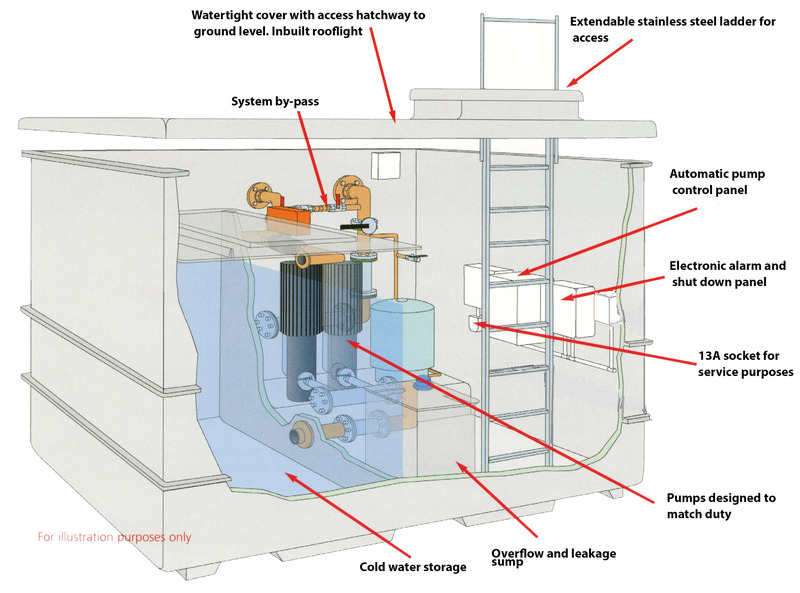 PODs provide boosted drinking water to buildings and are supplied as sealed enclosed housings requiring only external site water pipework and electrical connections. PODs are designed to specifically suit site requirements and there are five storage capacities from 1100 to 10000 litres, with twin, triple or quadruple pumps as required.